Once relegated to early adopters and casual home users, VoIP (voice over Internet protocol) has matured. An essential element of any unified communications (UC) system, it is now the standard method of voice communication in business, education, government and healthcare. If your organization has not already migrated to VoIP, the question is not so much if it will, but when. Cost is the primary driver, since the data network performs double duty by carrying voice traffic as well. VoIP also offers capabilities that far exceed traditional phone systems, with unified communication platforms promising to integrate messaging, mobility, collaboration, relationship management, zoned security, intelligent call routing, disaster recovery, video, teleconferencing, status updates and other advanced features. to power IP phones. This is especially true where power capacity, battery backup runtime and system availability are concerned. 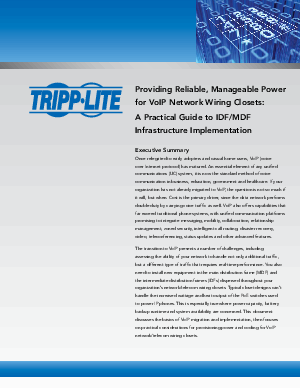 This document discusses the basics of VoIP migration and implementation, then focuses on practical considerations for provisioning power and cooling for VoIP network/telecom wiring closets.